Display has five angled shelves 12 1/2 in. D. Each shelf features a unique 3 1/2 in. acrylic front that keeps products in place. 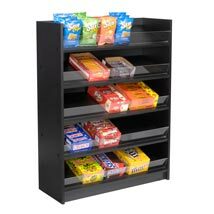 Position this display next to your checkout, back to back, or as an endcap for impulse sales. Assembles in minutes.